Dave sweeps up by the first fire in Graves Light’s new potbelly stove. 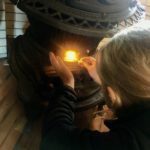 Mary lights the potbelly stove for the first time. 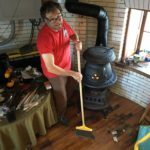 November 2016 began with a warm wood fire from our new potbelly stove. 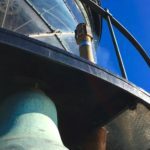 This is the first time Graves Light has been heated in about 40 years. It’s pretty nice to sit up here as the weather cools down and we don’t have to freeze On Station. 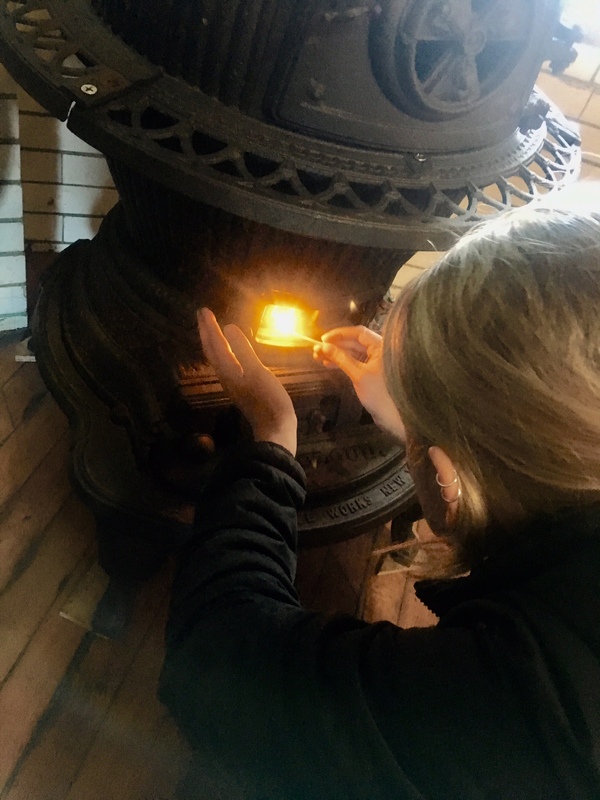 Thanks to the creative people at Nelson Metal Fabrication in South Portland, Maine, and our trusty volunteers, we now have a fully functional potbelly stove to keep us warm. 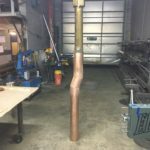 We found an antique smokestack salvaged from an old yacht. 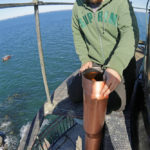 The folks at Nelson turned the smokestack into a 12 foot-tall chimney, hauled it down from Maine, and installed it at Graves Light. 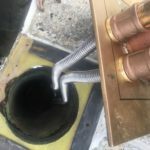 They connected the stove on the third deck with the original chimney shaft in the wall, and then ran the newly fabricated section of pipe and yacht smokestack through the original 1905 chimney stack channel, out the granite watch deck, and up and out the lamp deck. 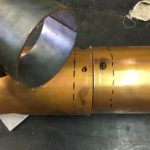 The gallery below tells the story in pictures: from Nelsons’ shop in Maine, to the fitting together of the new chimney with the old smokestack, to Jim and John installing the stack in the old chimney assembly at the lighthouse. Then a photo shows how the old yacht smokestack sits in place, out of the lamp deck, like the 1905 original. 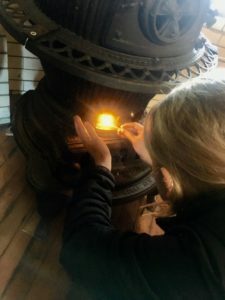 And finally – the glorious potbelly stove all lit up, filling the lighthouse with a welcoming warm glow from its iron hearth. Plus cleanup time. In South Portland, Maine, the new chimney assembly is ready to ship to the lighthouse. The joint where the new assembly (left) meets the antique yacht smokestack (right). 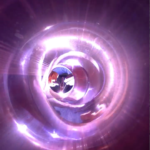 A still from an inside-the-pipe video of John Nelson welding the assembly together at his Maine shop. 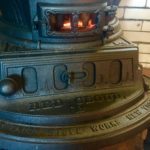 We used the original 1905 chimney assembly in the granite to install the 2016 replacement. Jim and John fit the chimney into place. Here’s how the chimney looks, similar to the original from more than a century ago. 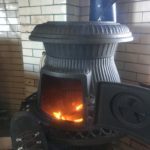 Feet up: Now we can relax by the warm potbelly stove, no matter what the weather. The new hearth of our Graves Light home.